My book on Mark are a combination of short stories with a few hints on how to get more out of a casual reading of the Bible. Character names are made up to make the stories come alive. Some of the stories are adaptations of real life stories brought together with stories and lessons in Mark’s Gospel. It is a unique style of writing and something worth looking into. Many of the stories in this book series are great for children stories as well as powerful sermon messages. Mark 12:1-12 NLTse Then Jesus began teaching them with stories: “A man planted a vineyard. He built a wall around it, dug a pit for pressing out the grape juice, and built a lookout tower. Then he leased the vineyard to tenant farmers and moved to another country. (2) At the time of the grape harvest, he sent one of his servants to collect his share of the crop. (3) But the farmers grabbed the servant, beat him up, and sent him back empty-handed. (4) The owner then sent another servant, but they insulted him and beat him over the head. (5) The next servant he sent was killed. Others he sent were either beaten or killed, (6) until there was only one left–his son whom he loved dearly. The owner finally sent him, thinking, ‘Surely they will respect my son.’ (7) “But the tenant farmers said to one another, ‘Here comes the heir to this estate. Let’s kill him and get the estate for ourselves!’ (8) So they grabbed him and murdered him and threw his body out of the vineyard. (9) “What do you suppose the owner of the vineyard will do?” Jesus asked. “I’ll tell you–he will come and kill those farmers and lease the vineyard to others. (10) Didn’t you ever read this in the Scriptures? ‘The stone that the builders rejected has now become the cornerstone. (11) This is the LORD’s doing, and it is wonderful to see. '” (12) The religious leaders wanted to arrest Jesus because they realized he was telling the story against them–they were the wicked farmers. But they were afraid of the crowd, so they left him and went away. Was Jesus preparing His disciples for the future by using words like beat, killed, and murdered, or was He only pointing out how the religious leaders treated God’s messengers in the past? Jesus’ parables are designed to point people back to scripture. 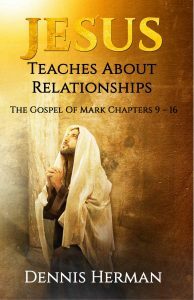 Jesus Teaches About Relationships: The Gospel of Mark Chapters 9 – 16. You can download the eBook here. It did not take long for news to spread, “Jesus is in the temple.” Some came to listen. Others came to be healed. A few let their curiosity led them. All of them crowded around Jesus, getting as close as possible to hear His words. The enormous crowd caused the workers to stop construction on the pens. The crowd poured out into the street outside the gate, making it impossible for the Levite priests to bring the lambs they had been able to gather back into the courtyard. Soon Jesus motioned everyone to sit. They all obeyed, expect for the priests, teachers, elders and temple guards. 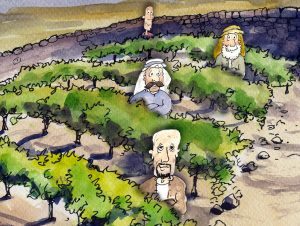 Then Jesus began teaching them with stories: “A man planted a vineyard. He built a wall around it, dug a pit for pressing out the grape juice, and built a lookout tower.” Their minds were filled with an image of a fine vineyard. Some imagined a simple farm with a small house just off a road, a barn, a few cattle in one pen, sheep in another, and rows of grape vines in even rows along a hill with fields of wheat and barley along side open pastures of grass. Some imagined an elaborate home with two levels, surrounded by a white plastered stone wall, large barns for storing crops, grape vines as far as the eye could see on one side, fields of golden wheat on the other. Herds and flocks were housed in a valley along with the hired help. Jesus continued. “At the time of the grape harvest, he sent one of his servants to collect his share of the crop. But the farmers grabbed the servant, beat him up, and sent him back empty-handed.” Jesus looked at the reaction of those listening. He could tell how it effected them. Some let out a deep, hollow grown. Others stroked their beards in a manner showing they had sympathy for the tenant farmers. They lived through a similar experience working long hard hours to see the fruit of their labor go first to the dishonest priests, who never seemed to have enough, pay the landlord, and of course taxes. There was hardly enough left to support their family. Jesus looked back at them with sympathy. If only they knew what Heaven had to offer. It seemed everyone forgot there was a price to pay. The entire courtyard remained silent. Every eye was fixed on Jesus as they waited for Him to answer His own question. Finally He spoke up. “I’ll tell you–he will come and kill those farmers and lease the vineyard to others. Didn’t you ever read this in the Scriptures? ‘The stone that the builders rejected has now become the cornerstone. This is the LORD’s doing, and it is wonderful to see. '” The religious leaders wanted to arrest Jesus because they realized he was telling the story against them–they were the wicked farmers. But they were afraid of the crowd, so they left him and went away. The disciples began to see a pattern emerging, but did not understand it, because it did not seem to identify with the Jesus they knew. Since He rode the donkey into Jerusalem, something seemed to change. One thing that still bothered them was, why did Jesus go to the temple and not Herod’s palace? Taking the throne would have made controlling the religious leaders much easier. If Herod was capable of keeping all the religious leaders under control, Jesus should have no problem once He took the throne. The disciples thought the priests, elders and Pharisees would be loyal once they understood. There were a number of details that concerned the disciples. At first Jesus cursed the fig tree and seeing it dried and withered seemed to be something they could use to their advantage. That seemed to be the beginning of a change in Jesus. First He killed a tree, then tore up the temple court, sending money and animals everywhere. When the Pharisees ask Him about the authority to dismantle the courtyard, Jesus answered by asking them where John the Baptist’s authority came from. They thought Jesus’ answer reminded Him Herod killed John. They felt sure that would prompt Jesus to dethrone Herod. None of this seemed to explain Jesus’ parable about the stone the builders rejected. Peter suddenly remembered what Jesus taught them about the scripture He quoted. Jesus always quoted texts with answers around the texts He quoted. Open for me the gates where the righteous enter, and I will go in and thank the LORD. These gates lead to the presence of the LORD, and the godly enter there. I thank you for answering my prayer and giving me victory! The stone that the builders rejected has now become the cornerstone. This is the LORD’s doing, and it is wonderful to see. (Psalms 118:19-23 NLTse). As Peter pondered the texts, he remembered how Jesus made His way into the temple court. Peter wondered how David could see those details long before they happened. It gave Peter a sense of comfort knowing Jesus was right where He needed to be. Peter suddenly felt a pit in his stomach as he realized there was a reason Jesus wanted to explain those prophecies. At the time they didn’t seem important. Maybe this was why Jesus has been acting strange. There is something about the religious leaders he did not understand at the moment. Peter wished he had taken time to listen. It seems useless to point out how modern religious leaders are making the same mistakes as those Jesus confronted in the temple court. No matter what faith people cling to, they all claim the world is misled, but they know the truth. They forgot, Jesus faced a number of groups, priests, Pharisees, scribes, and others, because disagreements on little details separated them. Small details have always fractured God’s followers, taking their minds off the role God gave them. Instead of listening to God’s messengers, they claim that role for themselves, rejecting anyone not 100% in line with their beliefs. Religions today have more in common with the priests and Pharisees than they care to admit. The fact Jesus’ disciples could not understand prophecy was being fulfilled before their eyes is a testimony we need to pay attention to on a personal level. Its not by mistake Jesus combined parables, prophecy, and relationships in His lessons in the temple court.